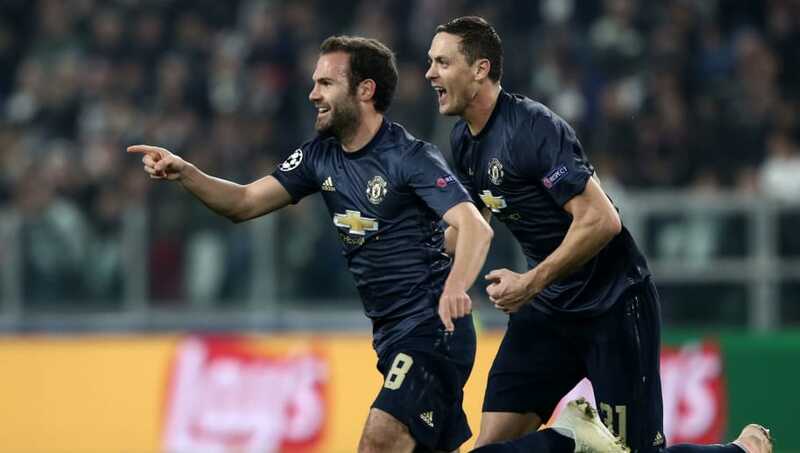 Manchester United scored two goals in the last five minutes to give their Champions League qualification hopes a huge boost with a fantastic win over Juventus. United started confidently and aggressively, getting forward in numbers and applying pressure in midfield, though they lacked a cutting edge in the final third. David De Gea was the first goalkeeper called into action as Juventus counter-attacked after a United corner, but Sami Khedira's shot did not trouble the Spaniard. De Gea made another save to push away a Juan Cuadrado shot that deflected goalwards off Nemanja Matic as the hosts started to take control. Khedira should have given them the lead but dragged a gilt-edged chance onto the post rather than into the gaping goal. United stemmed the tide and made it to half time on level terms, but they were under the cosh again early in the second half as Paulo Dybala struck the crossbar with De Gea rooted to the spot. The breakthrough came from a predictable source, and it was worth waiting for. Leonardo Bonucci lofted a great through-ball through to Cristiano Ronaldo and the Portuguese star caught it on the volley with a sweet strike that flew past De Gea before he even knew what had happened. Miralem Pjanic and Cuadrado both wasted good chances as the Italian champions threatened to add to their lead, but they were made to pay for these missed chances with four minutes left when Juan Mata equalised with a brilliant free kick which flew past Wojciech Szczesny. And it was another set piece which produced the winning goal. Ashley Young's free kick drifted into the corridor of uncertainty and Szczesny's save deflected off his own defender Alex Sandro and over the line to widespread disbelief. Juventus suddenly had a sense of urgency but United held firm and it was too little, too late. United are now just two points behind Juventus and will book their place in the knockout stages on matchday five if they win and Valencia don't. Juventus shouldn't be too concerned about the manner in which they threw away this match. They were totally in control for 85 minutes and both goals came from set pieces - the first of which was sublime; the second, admittedly, a mess. It was the lack of attacking impetus which may be a slight concern though. They only created one clear-cut opportunity in the whole of the first half and only a handful in the second. Ronaldo's goal was actually one of the harder opportunities that fell to them. Of course, Juve are still top of Group H and will probably still advance as group winners. But if they want to end their long wait to lift the Champions League, they need to learn how to close out games. Despite Juventus' late surrender this was another towering defensive display from Leonardo Bonucci, who also had a big part to play in Juve's goal with his brilliant lofted ball to Ronaldo. A lot has been made of Ronaldo's signing, but bringing Bonucci back could be just as important to Juve's Champions League hopes. Bonucci’s the best ball playing CB in the world man. His passing ability and range is off the charts. That pass from Leonardo Bonucci has to come with a "parental advisory"-stamp. Pornographic. Sami Khedira didn't exactly have a bad game, but he was probably the least influential of Juventus' midfielders and he really should have scored with the goal gaping in the first half. Having failed to keep a clean sheet in any of their last five games, the most pleasing thing for Manchester United will have been the strength of their defensive performance. Up against one of Europe's most dangerous attacks, they acquitted themselves admirably, limiting their opponents to very few clear-cut opportunities, and there was nothing to be done about Ronaldo's goal. The Red Devils rode their luck at times, but they deserved it, and after starting the season with such a leaky back four, they now appear to have found a more solid basis on which to build. The task for Jose Mourinho is to transfer this new-found solidity into the Premier League. Sunday's trip to Manchester City will be the acid test and it may come too soon. If United play as they did against Bournemouth, they will get tonked. If they play like they did in Turin, anything is possible. Except for one nervous moment at the start of the second half, this was another excellent performance from Victor Lindelof. The Swede was much-maligned last season but he is finally starting to show the ability that convinced United to spend £35m on him. Lindelof at last resembling the defender United hoped they bought. Herrera and Young also refereeing the game very well. Pleasing to see Lindelof growing into his own. An argument can be made that his development might have been faster and better if he had a REALLY top level CB to guide him. But he looks a different player to the shaky,unreliable bag pf nerves he was a few weeks ago. Paul Pogba's presence may have forced the own goal that won the match for United, but that shouldn't mask the fact that he was pretty poor once again, struggling to exert his influence on the game. Juventus are certainly better off with the midfielders they have now. For all his talent, Paul Pogba is one incredibly frustrating player. Lindelof again the best Utd player. Been on the end of every ball. Excellent. Pogba been so sloppy. Matic poor again. Pogba worst player on the pitch so far. Manchester United have taken 10 points from their last four Premier League matches but Sunday will provide the toughest test of their credentials so far as they face league leaders Manchester City at the Etihad Stadium. Juventus, six points clear at the top of Serie A, will also face a tough test on Sunday as they travel to the San Siro to face AC Milan. The two teams are back in Champions League action on November 27, when Manchester United host Young Boys and Juventus welcome Valencia.